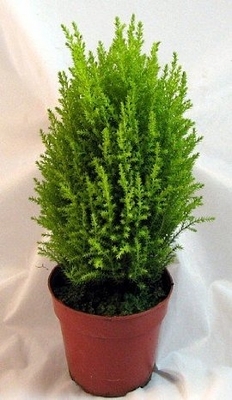 Lemon Scented Goldcrest Cypress Tree (Cupressus macrocarpa "Gold Crest") makes an excellent indoor or outdoor tree. It is hardy in zones 7-9 or grow indoors in a cool and sunny window. Keep the tree evenly moist, not wet or dry. You can place the living tree almost anywhere for the holidays. It looks fantastic with miniature ornaments. A great gift for almost anyone or yourself. Hardy in zones 7-9 or indoors Prefers a sunny location Makes a great indoor Christmas Tree Fresh, lemon scent to the tree Immediate shipping in 4 inch pots.